Once the squash is cut, drizzle with oil, sprinkle with salt, and microwave until soft. This usually takes 8 to 10 minutes, depending on the size of the squash and your microwave. You are looking for the squash to separate into spaghetti like noodles with a scrape of your fork. If you have the time, you can bake the two halves in the oven at 375 for 30-50 minutes depending on the size of your squash. Scrape into bowl, season salt and garlic powder and set aside. In a large saucepan heat a tablespoon of oil on medium high and add onions, once lightly caramelized (about 5 minutes), add mushrooms, allow to get a little color and season with a little salt. Next, add the peppers and garlic and allow to cook for another 5 minutes until vegetables are all nice and soft. Then transfer vegetables to a medium sized sauce pot and add your marinara sauce and dried spices to the vegetables. Wipe clean your saucepan and bring to medium high heat. Add your sausage and toss every two minutes until each piece is nice and brown. Once brown, add to your sauce. 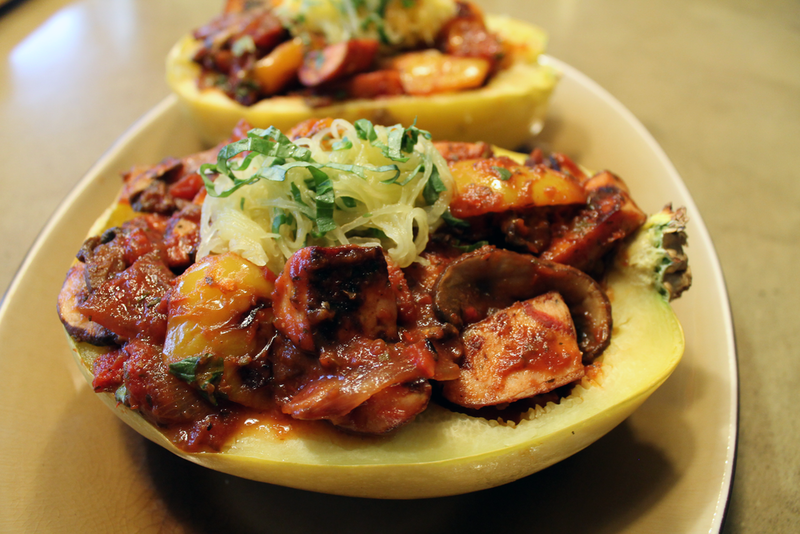 To assemble add squash back into its shell or in a bowl. Top with spoonful’s of sauce and garnish with fresh basil. In a large mixing bowl combine all ingredients and whisk until fully incorporated. Taste dressing; add another avocado for thicker texture, or a dash more of salt if needed. Dried herbs can be substituted for fresh if you don’t have any fresh herbs on hand. Keep in a mason jar in the fridge for up to 5-6 days. *If making ahead of time do NOT add avocado until day of! Mix all ingredients in a large mixing bowl and toss until the dressing evenly coats the chicken and veggies! This dish is best served cold. If you want to turn this into a lettuce wrap, crumbled uncured bacon or turkey bacon is delicious on top! To save time in the kitchen you can buy your vegetables pre cut in the fresh produce section of your grocery store. Or, if you are like me, you want to save money and do it yourself. Preheat your oven to 425 and place oven rack one level away from the bottom in your oven. Using two cookie trays or one large tray. Put your 3 vegetables in 3 separate piles on your trays. Mix all of your spices together and use half of spice mixture on the vegetables. Put about a tablespoon of oil on each vegetable pile, sprinkle each pile of vegetables with 1/3 of the vegetable spices and toss until evenly coated. Spread out evenly on cookie trays and put brussel sprouts cut side down. Then put vegetables on the lower rack in the oven and bake for 25-30 minutes. Season and rub the spices into the chicken. Heat a cast iron or oven safe pan on medium high, once hot add chicken skin side down and do not touch for 3-4 minutes. Rotate chicken thighs 90 degrees in the pan to evenly distribute heat and ensure skin turns golden brown. This will take about another 3 minutes. Once golden brown flip chicken skin side up and place in oven for 15-20 minutes until internal temp reaches 165 degrees. I love to finish the chicken with a squeeze of fresh lemon.